Black crepe blouse in a flattering A-line shape with buttons up the back. 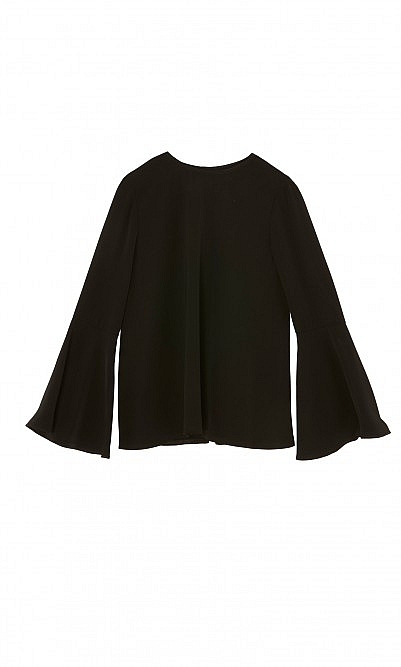 Sleeves are slim and sculpted to flare from elbows. L62cm. Polyester. Very nice sleek black blouse. The body is slighly a-shaped which I find very flattering. Length is just about right, Not too short. The sleeeves are gently fluted without being annoying. Lovely blouse, very versatile. Very elegant in no time with a nice piece of jewellery.